This is a very nice and soft quilt. The color is as pictured. It is not to heavy and not to thin. It is the perfect weight we were looking for to use all year. 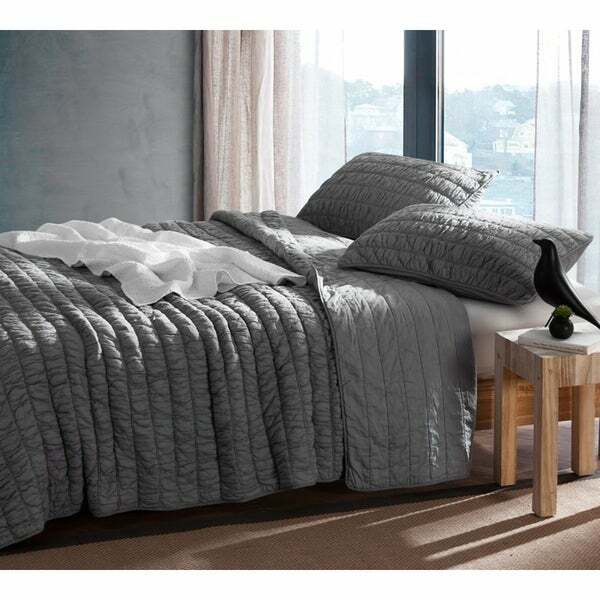 For high impact, versatile bedding, add our Alloy Cotton Pure Textured Quilt to your room decor. Great style begins with your bedding and here at Byourbed we believe you don't have to give up comfort for looks! Our machine washable Alloy Cotton Pure Textured Quilt will instantly give your bedroom a fun new feel, and will feel great as you snuggle up at night with this cotton quilt's soft and cozy touch. Our Twin XL Alloy Cotton Pure Textured Quilt comes with 1 matching sham and sizes Full, Queen and King include 2 matching shams. This BYB Quilt is comfortably soft to the touch and constructed of defined 230 GSM and has an inner fill of 90% Cotton and 10% Microfiber. Obsessed with this 100% cotton bedding set! It’s so soft and slightly oversized for those higher mattresses. Looking for a king set for my other bed now. Would highly recommend the BYB brand! It'a not exactly the color I was hoping for. It's a bit more washed out. I plan on ordering something darker to add to our bed because this alone just doesn't fit the look we were going for. I will try to include a photo but dont see that option for this review. Also when it 1st arrived it was missing both shams. I contacted Overstock and they got on it pretty quick. Shams were sent to me within a couple days. I've had a few issues here and there with orders but Overstock continues to impress. They've resolved all my issues this far. Love this set. Feels so comfortable and has a great modern look. Won't show dirt so quickly, very forgiving when you have grandchildren running around. Will be very easy to wash in washing machine & dryer. "Is this a light weight quilt? I live in Florida and do not want a heavy quilt." This is a medium weigh quilt as it it has a lining.